Affiliation: NTT Nanophotonics Center and NTT Basic Research Laboratories, NTT Corporation, Atsugi-shi, Kanagawa, Japan. Random access memory (RAM) is used extensively in a wide variety of instruments. It is based on the bistable operation of electronic transistors and memorizes bit information. Recently, its optical counterpart, optical RAM (o-RAM), has become highly desirable in high-speed network processing, especially for routers, because it is more efficient to manage network information all-optically without power-consuming electric-to-optical (EO) or OE conversions. Various o-RAM devices have been proposed and fabricated, but so far they have been too big, too power-consuming, or too difficult to integrate. In 2012, we demonstrated ultralow-power and ultra-small o-RAMs using a photonic crystal nanocavity . Photonic crystals enable strong light confinement, so these o-RAMs were able to achieve a huge reduction of footprint and power consumption. However, the size of these o-RAMs was limited to just four bits. In the June 2014 issue of 'Nature Photonics' , we reported our successful integration of wavelength-addressable 105-bit o-RAMs. This is the first realization of an integrated o-RAM with more than four bits. We implemented a 105-bit o-RAM in a small silicon photonic crystal chip less than 1.1 mm long (Fig. 1). This chip contained 128 nanocavities, each of which can serve as an o-RAM. This novel configuration enables wavelength-addressable o-RAM operation. Figure 1: (a) Electron microscope images of large-scale nanocavity array integrated in a Si photonic crystal. (b) Transmission spectrum of nanocavity array coupled to an in-plane input/output waveguide. 105 cavities can be operated as bistable optical memories. (c) Schematic of o-RAM operation using the bistable output bias power of a nanocavity side-coupled to a bus waveguide. (d) o-RAM operation of 105 cavity modes in the nanocavity array. First we explain how an optical memory works. It is well-known that a cavity with optical nonlinear medium exhibits optical bistability at a certain condition. In the present device, we make use of this phenomenon for bit memory operation. Figure 1(c) explains operation mechanism. When one injects light into a nonlinear cavity, the output light intensity shows hysteresis with two bistable states. We can switch between the two bistable states by applying an optical pulse or cutting the bias light. This operation can be used as a bit memory where the high output state (OFF) and low output state (ON) correspond to binary information of '0' and '1'. It should be noted that in a photonic crystal nanocavity, the optical nonlinearity effect is greatly enhanced by high quality factor (Q: ~105) and ultra-small mode volume (< 1 (λ/n)3). 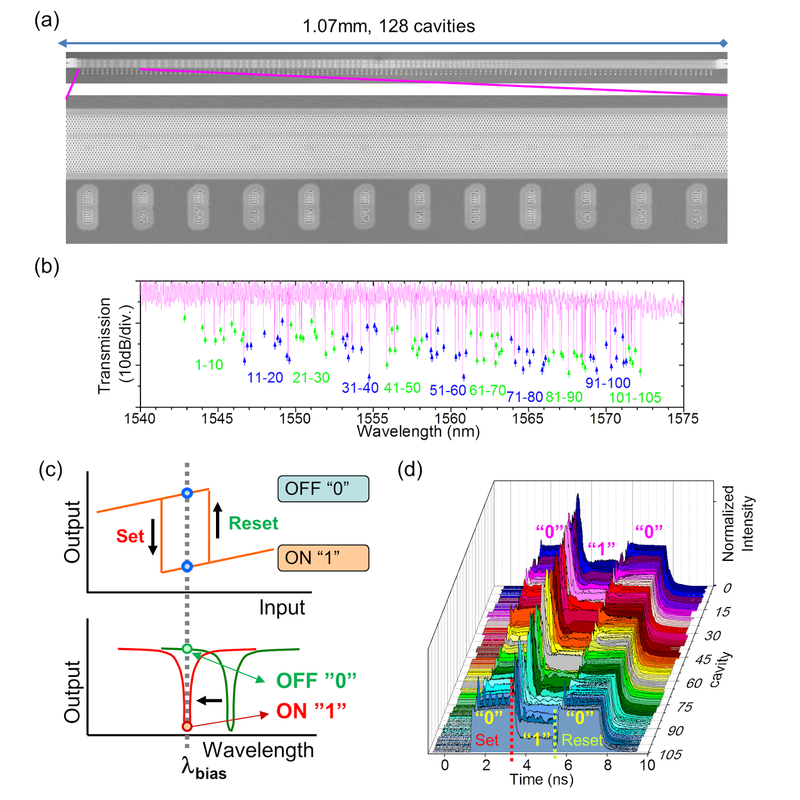 In the present study, we were able to achieve bistable o-RAM operation of 105 nanocavities integrated monolithically in a photonic crystal chip as shown in Fig. 1(d). The optical transmission spectrum is shown in Fig. 1(b). Here each dip corresponds to each cavity. Fabricated cavities have different resonant wavelengths with an averaged spacing of 0.23 nm, which was realized by precisely changing the lattice constant of photonic crystal by 0.125 nm. Such high level of nanofabrication accuracy was achieved by cutting-edge electron beam lithography. In order to realize wavelength-addressable o-RAMs, each cavity should have a sharp resonance and a wide mode spacing to avoid undesired mode overlap. Conventional high quality factor (Q) cavities in a photonic crystal do not have sufficiently wide mode spacing. It is well known that a three-missing-hole defect cavity (so-called L3 cavity) in a photonic crystal has a wide mode spacing, but suffers from relatively low Q . To overcome this problem, here we employed a modified L3 nanocavity as shown in Fig. 2, where we systematically tuned the 6 sets of the holes denoted A-F. Figure 2: (a) New tuning design of an L3 nanocavity that improves Q over 10 times. (b) Spectrum of the fundamental cavity mode of an L3 nanocavity. The full-width half-maximum (FWHM) line-width (1.5 pm) corresponds to the experimental Q of 1.0 X 106. This novel design allows ~10 times enhancement of Q to the conventional L3 cavities with keeping the volume of the cavity mode. Not only the theoretical Q but also the experimental Q was enhanced to ~106 which is 10 times higher than previously reported value . The above-mentioned highly-dense wavelength division multiplexing scheme was enabled by this high performance of modified L3 cavities. Although we employed Si for o-RAMs discussed above, we also employed InGaAsP for constructing multi-bit o-RAMs, which showed even small operation power (~100 nW)  owing to the efficient optical nonlinearity. We are expecting that the present technology will be employed in an all-optical router as we mentioned. In this application, gigantic RAMs are not necessary, but kilobyte-sized RAMs would be sufficient. To realize this, we plan to combine the present wavelength addressing memory integration scheme with the parallel integration scheme. We have already demonstrated the parallel integration of o-RAM with an all-optical addresser in four-bit o-RAM . The appropriate combination of two methods would be sufficient for our target. Of course, high-speed optical RAMs should also play various important roles in all-optical logical processing other than routers. In addition to that, the demonstrated wavelength addressing nanocavity integration technologies for o-RAM can also be applied for other types of devices such as multi-channel all-optical switches . Kengo Nozaki, Akihiko Shinya, Shinji Matsuo, Yasumasa Suzaki, Toru Segawa, Tomonari Sato, Yoshihiro Kawaguchi, Ryo Takahashi, and Masaya Notomi, “Ultralow-power all-optical RAM based on nanocavities”. Nature Photonics, 6, 248 (2012). Abstract. Eiichi Kuramochi, Kengo Nozaki, Akihiko Shinya, Koji Takeda, Tomonari Sato, Shinji Matsuo, Hideaki Taniyama, Hisashi Sumikura and Masaya Notomi, “Large-scale integration of wavelength-addressable all-optical memories on a photonic crystal chip”. Nature Photonics, 8, 474 (2014). Abstract. Yoshihiro Akahane, Takashi Asano, Bong-Shik Song, and Susumu Noda, “High-Q photonic nanocavity in a two-dimensional photonic crystal”. Nature, 425, 944 (2003). Abstract. Kengo Nozaki, Eiichi Kuramochi, Akihiko Shinya, and Masaya Notomi, "25-channel all-optical gate switches realized by integrating silicon photonic crystal nanocavities". Optics Express, 22, 14263 (2014). Abstract.